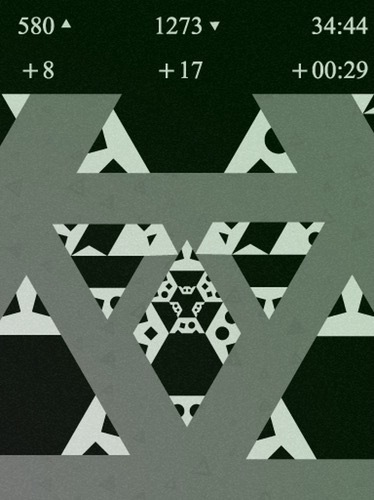 Kenny Sun’s YANKAI’S TRIANGLE is a very simple puzzle game. Perhaps under different circumstances, I might have found it too simple and deleted it after a few minutes. But instead, I played through over three hundred levels in less than twenty-four hours and still keep going back to it. I can’t stop. And since there’s effectively an infinite number of randomly generated levels, I don’t have to. So what makes YANKAI’S TRIANGLE so compelling? I think it’s a number of factors that, each on their own, might not be all that special. But as a whole package, it makes for a satisfying game that’s hard to put down. So first, let’s talk about the gameplay. Each level consists of a series of triangles. You start off zoomed in on four of them, laid out so three surround one. You tap a triangle to rotate it. The goal is to match the sides of the center triangle to the sides of the outer triangles. 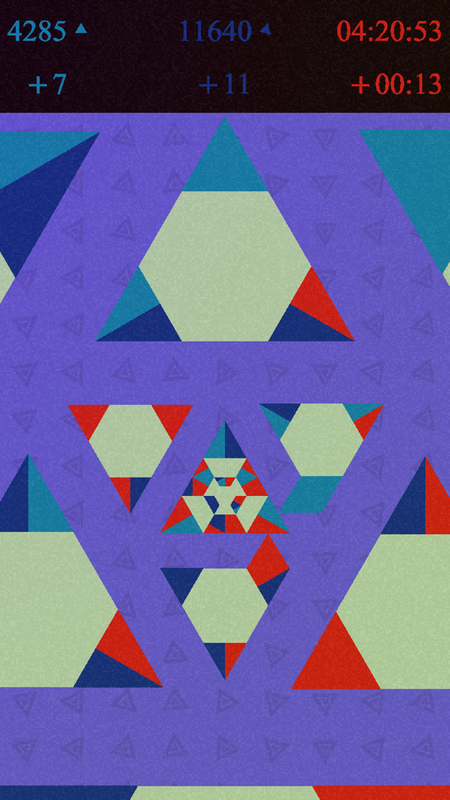 When a side matches, the two triangles get pulled together. 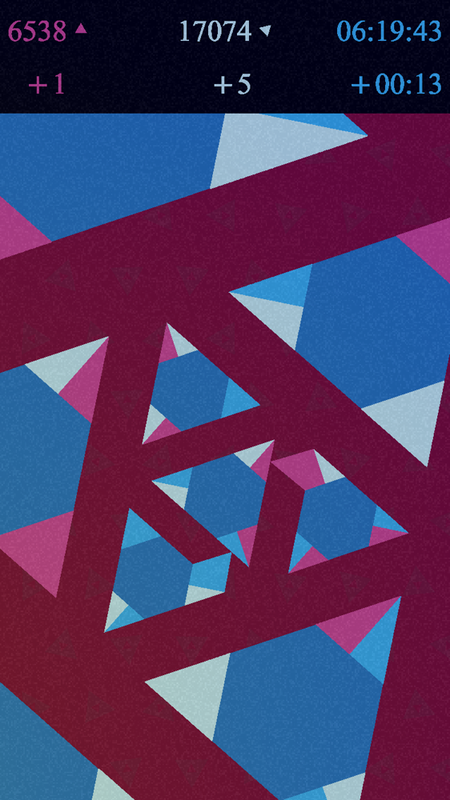 By the end of the level, all your triangles should be locked into each other to make one big triangle. Some levels consist of just those four triangles. But as you continue, they get more complex. Those four triangles can be surrounded by another three triangles, and then another and another. 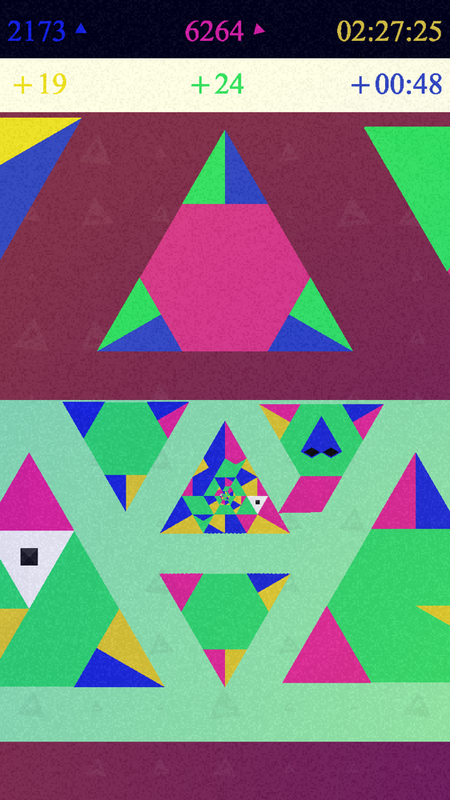 To access another layer, you simply tap on one of those triangles and the game will zoom out to focus on them. Sometimes, you might even have to start on the outermost ring and work your way in to the center. But this game is primarily about trial-and-error, and you can usually just mess around with each layer at a time, making small adjustments when something doesn’t work out quite right. It’s a very relaxing, meditative experience. And it doesn’t sound all that stimulating, does it? But the game does throw new mechanics at you every once in a while. There are triangles that don’t rotate and others change the location of all three triangles. Others rotate two triangles at a time, or rotate one triangle two rotations at a time. There’s even a rare one that won’t stay in place if another triangle near it locks into place after it. 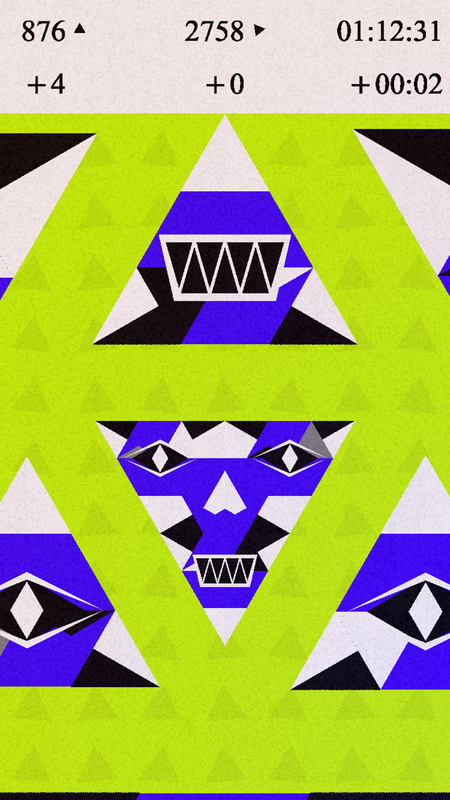 There are also variations as to the designs of the triangles. The easiest puzzles to solve have just one color on each corner. It’s hard to mess that up. But when corners get split between two colors, or even have colors along the sides of the triangle that you need to also match, it gets more challenging. Still, it never becomes a frustrating experience, because so much of it is trial-and-error. And even though there’s a timer, the GameCenter leaderboard actually rewards you for taking longer. As odd as that is, I’m appreciative of it, because it keeps the game relaxing. I can mostly ignore the timer and just use it to see how long I’ve been playing. Also, the sounds and artwork prevent the game from ever becoming a headache. What helps keep YANKAI’S TRIANGLE interesting for me are the soundtrack and visuals. They’re constantly shifting and changing to keep it from getting stale. Some are simply for entertainment purposes, but others add difficulty to a puzzle. For instance, sometimes the color will change when you zoom in on a different layer. This can throw you off a bit and make it harder to plan out your moves. 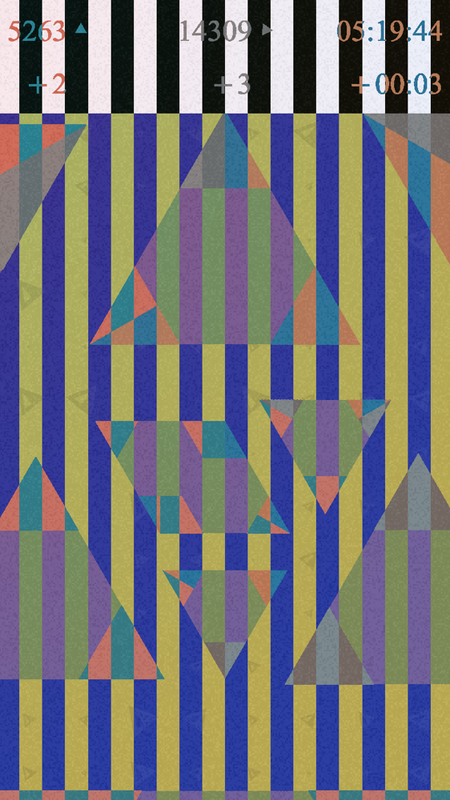 An even trickier visual aspect is when the whole puzzle rotates when you change layers. It can be disorienting, like spinning in place before pinning a tail on a donkey. You’ll also occasionally encounter lines that break everything up into different colors, once again trying to confuse you as you’re matching colors. But it’s just a small distraction. In any case, the colors are constantly changing from level to level, so the game remains visually stimulating even hundreds of puzzles in. Part of the enjoyment of the game is just seeing all the different color palettes it comes up with. And then there’s the soundtrack. I can’t do it justice with words, so I suggest watching the little video I made below. But there’s no music in the game. Instead, you have varying types of background noise, ranging from something simple like rain, or even a crowd of noisy people. One of my favorites is the creepy voice going “tick tock, tick tock,” and another one makes me think of the noise Gremlins make. On top of that, there’s the immensely satisfying sound effects. Different types of pieces make different noises. 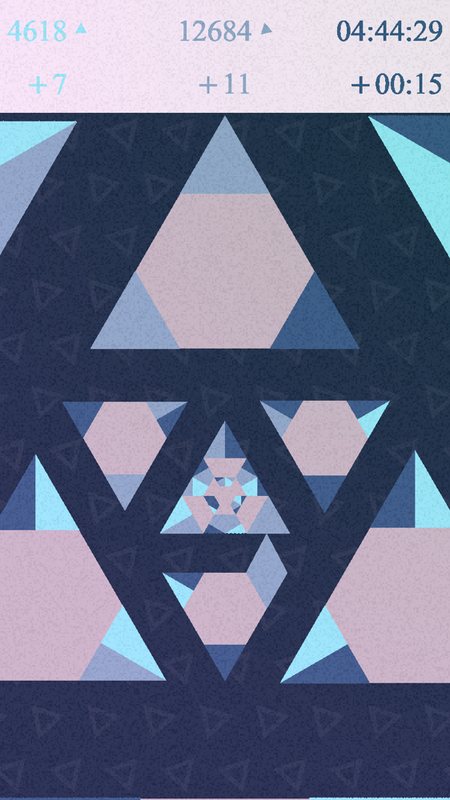 Most triangles sound like stone slabs sliding into place and clicking together. But the pieces with eyes and mouths on them make more of a squishy noise. The whole soundtrack is just amazing. There’s so much variety that I’m never sure if I’ve heard everything the game has to offer, even after more than three hundred levels. And because of this variety, I always want to give it my full attention. It’s one of few games that I can’t even imagine playing with my phone muted. When I’m out playing it in public, I use headphones so I can still hear all the glorious sound effects. Usually I scoff at games with endless randomized puzzles. Or even hundreds and hundreds of handcrafted levels. I much prefer the filler-less games like Snakebird. But there’s just something so so satisfying about clicking those triangles into place that it’s been holding my attention despite the fact that the progression is very uneven and it only really throws in a challenge once in a while. I think it might help to see it more as a toy than a game. I’m just enjoying tapping those triangles and am kind of glad there’s no end to it. I’m sure I’ll burn out at some point, the same way I do when I listen to music I like nonstop. I mean, I played over three hundred levels in less than twenty-four hours. It is starting to get old, and maybe I should take a break. But I still keep going back to it. And even after I stop, I can definitely see myself pulling this out every once in a while to play a few levels here and there. After three hundred levels, I encountered one where all the triangles were the same so all I needed to do was zoom out and let them lock into place. Another one a little while back was just four triangles already in place to lock in without any input from me. But who cares? There’s an endless amount of content. The main down side to all this is that it might feel like a time-waster if you don’t truly love it. It’s a slow-burning game that still throws new things at you at level 340, even though much of the content till then has been filler. And, yes, this would normally be something I criticize in a game. But I’m absolutely obsessed and am actually glad that the game is rewarding me for sticking around so long. It makes me wonder if there will be some surprises even a thousand levels in. Two years down the line, will I encounter something new? There’s something really amazing about that idea and I just can’t hate on the game for consuming so much of my life with what is essentially a time-waster. I should also mention that there’s a colorblind mode, which seems to sometimes include colors but is more often black and white with shapes on the sides of the triangles. I’m not colorblind, so I don’t need to play through the whole game that way. But I did spend a little time with it, and the game does lose a lot of its magic without the colors. The visuals play such a big part of it, that I can’t imagine I’d have played as much as I have so far if I were stuck playing in colorblind mode. But if you have to, it’s nice that it was included as an option. I do have a couple of small complaints. I wish the game had iCloud, since there’s no way I’m going to keep two separate games going of unlimited levels. Also, it would be nice if the iPad version could play in landscape mode, especially since the game is also on PC. Those two coupled together would mean I could enjoy it at home on my bigger iPad but still take it with me everywhere on my iPhone. This is a game that I’ll be playing for a long time, so I do hope those features are added somewhere down the line. Basically, if you’re not colorblind and you enjoy relaxing puzzlers, I recommend giving YANKAI’S TRIANGLE a try. It may not seem like much on the surface — and believe me, I was worried it wouldn’t hold my attention — but once you’re tapping those triangles and watching them click into place, you might just find yourself as addicted as I am. You can download the game here for a one-time low price with no IAPs or ads — just infinite pleasure. And make sure to let me know what you think in the comments section!